Firstly – SORRY! We know we’ve been bad bloggers – This travelling round the world business is complicated, it takes time – and the internet is not quite as worldwide as it is made out to be (or at least WiFi anyway)! We promise we will do what we can to put things right, and to fill you lot in on what we’ve been up to – ready yourselves for a deluge of our news…. As we take to the road once more it’s high time that we switch to a captains log narrative, partly because it is thoroughly befits a voyage of this kind – but mainly because without it we won’t remember where the flip we were, or what was going on, and this blog will quickly degenerate to drivel. Landing back in Istanbul was an interesting feeling, with the welcome distraction and recovery time in La Reunion now behind us, the adventure was once again ON. Like Donkey Kong. All we had to do was get Ivor back and we could get on our way. Before long we were in a taxi and in search of the gent that had agreed to look after our truck while we were away; Engin Firat, brother to a good friend’s wife and a native of Istanbul. Within a few minutes of arriving at his work we were given tea and fed, and upon learning that we were to stay in the city that night he also insisted that we stayed at his house – giving up his bed and staying elsewhere to make sure we would be comfortable. The guy is unendingly generous, even towards people that he had barely even met before, and with whom he found it very difficult to communicate since few words in English overlap with those in Turkish. An example to us both. Thank you Engin! The day started with a search for an internet connection and a launderette, we succeeded with the former, but despite our best attempts at a game of charades with local shop keepers we failed at the latter. After a bit of a faff we were free to get on our way, looking for a DHL centre on our way out of town to send off Kim’s passport to Canada so that an agency there could submit an application for a Chinese Visa on her behalf to the local consulate in Toronto. We first suspected that something was not right as we descended through some tiny Istanbul back streets, surely an international shipping company wouldn’t have a depot anywhere near here? 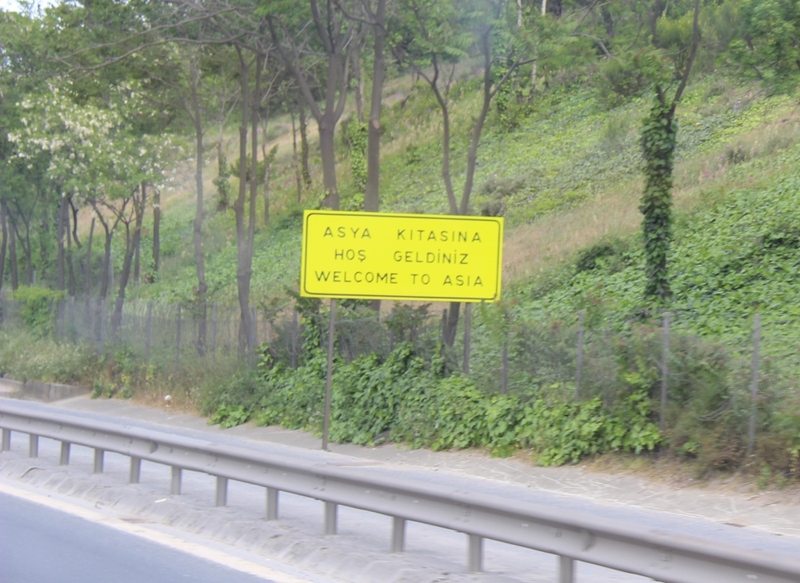 With the help of a local shop keeper we figured out that we had fallen foul of a Turkish practical joke – to have 2 roads with the same name in the same city. 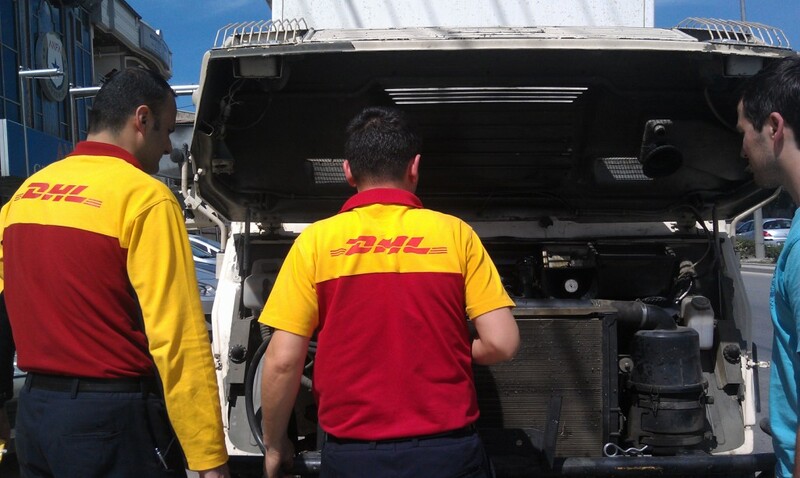 We’d run out of time to get to the real DHL before the depot shut, so continued on our way out of town. 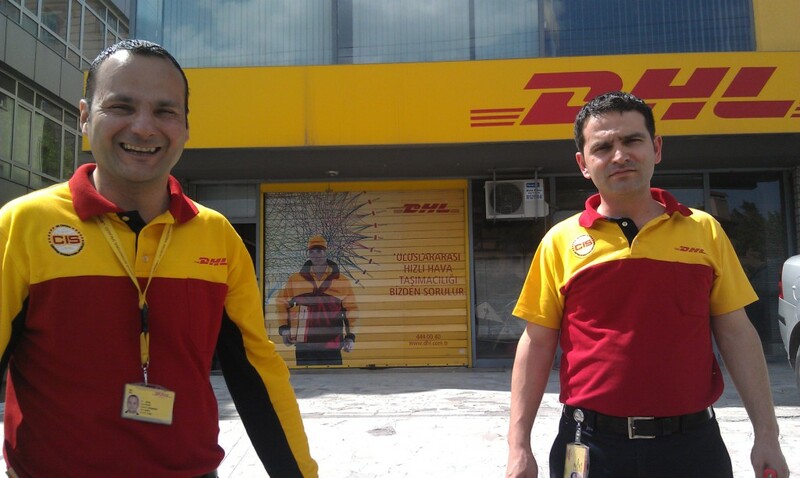 We couldn’t help but notice that our new route was taking us straight past the largest DHL outlet that we had ever seen albeit one that was far too close to shutting for the evening. Damn and blast. A few hundred uneventful kilometers passed before we pulled into a service station to set up camp for the night. We awoke and set about a search for that most basic of human needs: Wifi. 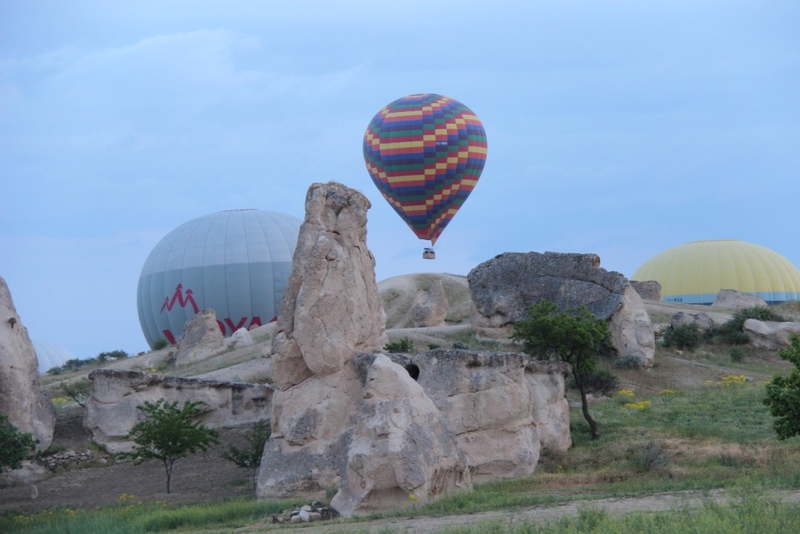 We searched out a DHL in the country’s capital Ankara, which we would pass on our way to the famed ‘must see’ region of Cappadocia. We were more careful to avoid doppelgangers this time. An easy cruise to Ankara followed, and the passport / visa application entrusted to the courier before we knew it. Things couldn’t be going this well, surely? On returning to Ivor from the DHL office, Kim spotted the surprise he had been keeping for us; the drip drip of oil onto hot Turkish Tarmac. The cause quickly identified as a lack of oil cap on the top of the engine – it is possible that the fault lies with Vaughan, who after giving a top up that very morning had not put the cap back on tightly enough. Alas, the truth may never be known. By complete luck, the cap had been lost recently enough that the oil level was only slightly below the ‘min’ marker. The kindly folk at DHL were quick to provide us with a bodge job fix in the form of a plastic envelope cable tied over the open hole, and directions to an area of town with plenty of garages. As is often the way, once back on the road the directions were harder to follow than had seemed at the time of explanation. 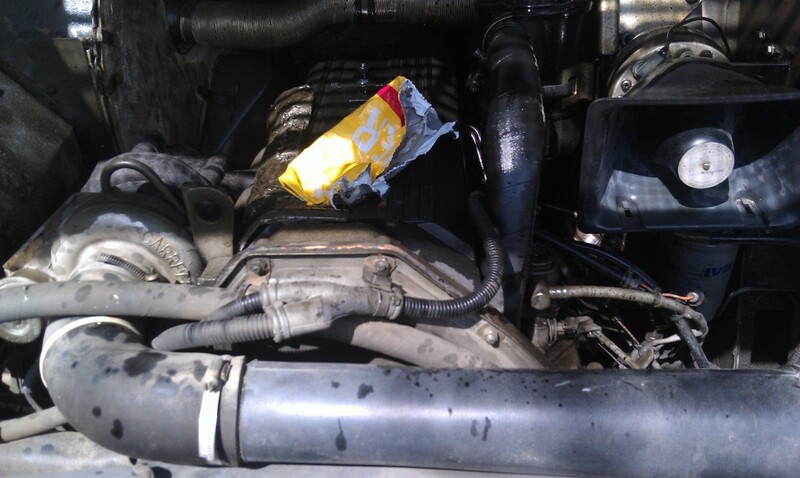 We pulled over into a nearby semi-derelict petrol station – we were lost, running out of time to get to shops, and unsure if the bodge would hold since the envelope appeared to be melting and being sucked into the hole. The men hanging about the station were interested to find out what might have brought this couple of foreigners to their forecourt, and why they were flapping about with the bonnet (hood) open of their peculiar vehicle. 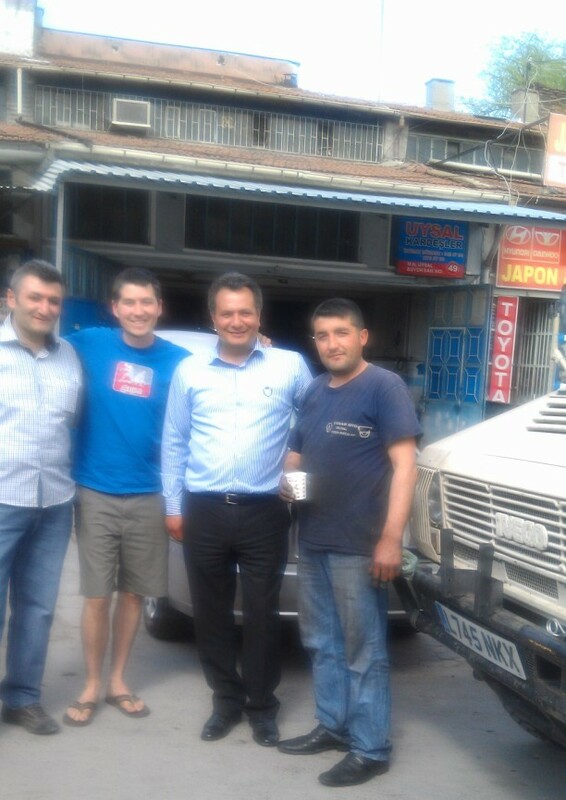 We were greeted in the traditional Turkish manner – with two cups of tea being pushed in our direction, and very quickly oil caps were being pulled off their various cars, roadworthy or otherwise, to see if a replacement could be found. Unfortunately none of them did. One of the men spoke a little English, and told us to follow him to a friends’ garage where they too could try to help. So another bodge was found and we were off again. On arrival we were greeted by another group of men eager to help, and more cups of tea. More caps were tried, and the third followed the rule of luck by fitting straight on there, nice and snug. Our new friend Mustafa made it clear that no money was to change hands, and we were even given a new road map of Turkey as a parting gift before being sent on our way. A few hundred more km under our belts, and we parked up at another service centre for the night. 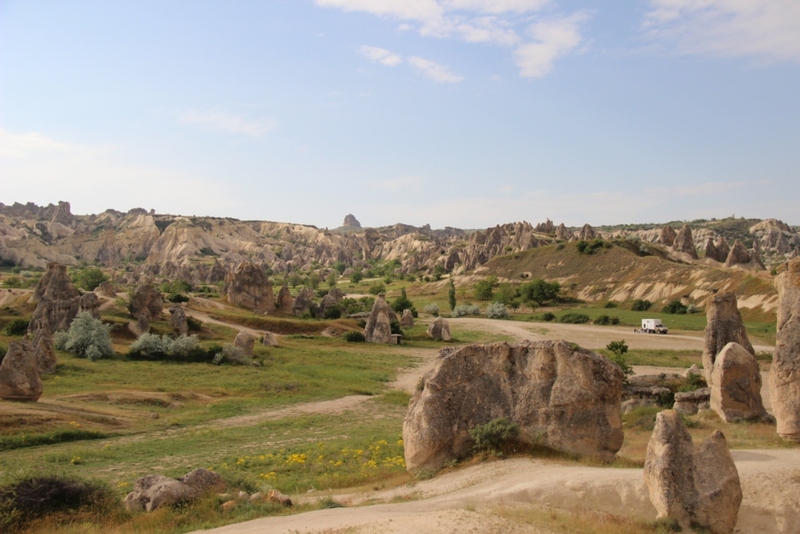 After a night of sleep regularly interrupted by irritatingly loud announcements from the market on the opposite side of the street that was seemingly of the 24 hour variety, we continued on the last leg of our journey to Cappadocia. 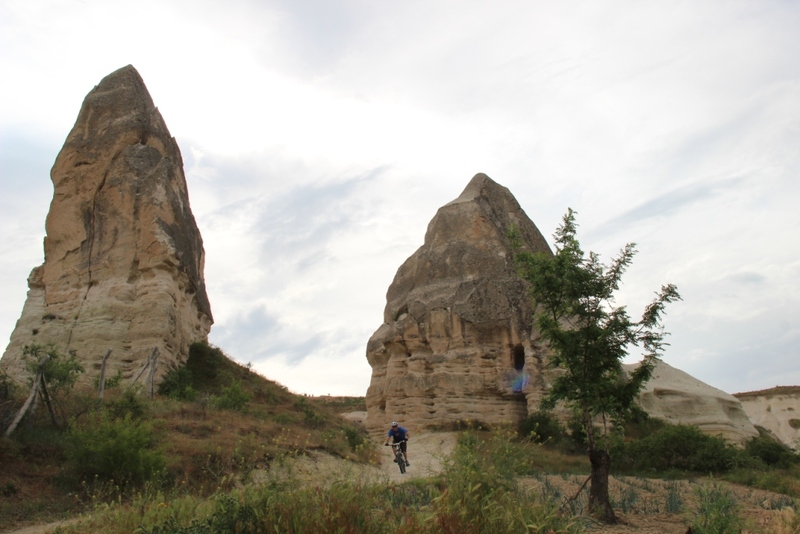 On arrival we were instantly in awe of the place – with enormous sandstone valleys, and villages carved into the rock it was clear that Unesco had chosen well in deciding to protect the site. We set about the search for internet, and to figure out just what we were going to do here. “Visit the open air museum” was the answer of many a local and guidebook, so off we trotted. The museum itself is basically an ancient village, largely carved out of the valley sides, dating back to 500 AD (ish, as far as either of us can remember, it was a while ago we were actually there…), when early Christians hacked all sorts of structures out from the stone just using axes. Someone in the 18th century saw fit to cover the place with large garish frescos, as was popular at the time, but fortunately they had left some of the original work from those early monks untouched, which can still be seen there today. After the museum we made a little use of the off road ability of the truck to escape the main tourist hub of the town and to find some outback camping in one of the area’s many valleys. A rude awakening this morning as a commotion broke out seemingly all around the truck at about 5am. 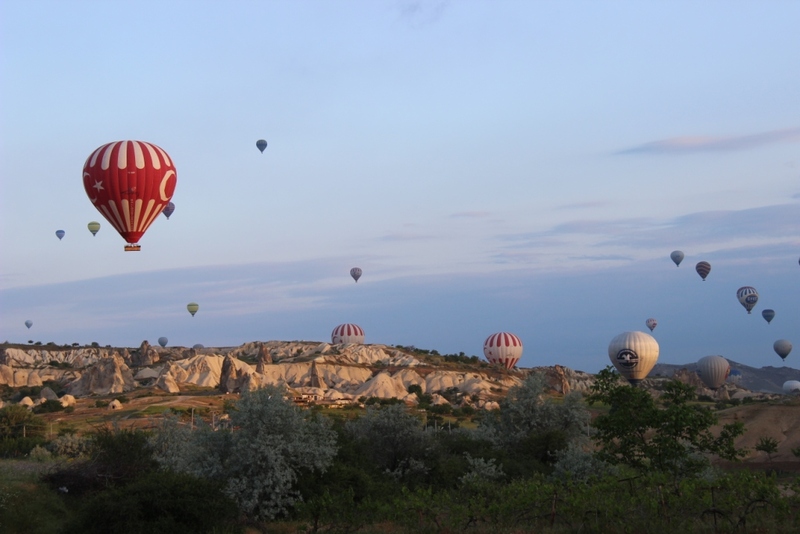 We were about to discover another reason that Cappadocia is famous; for it’s hot air ballooning. 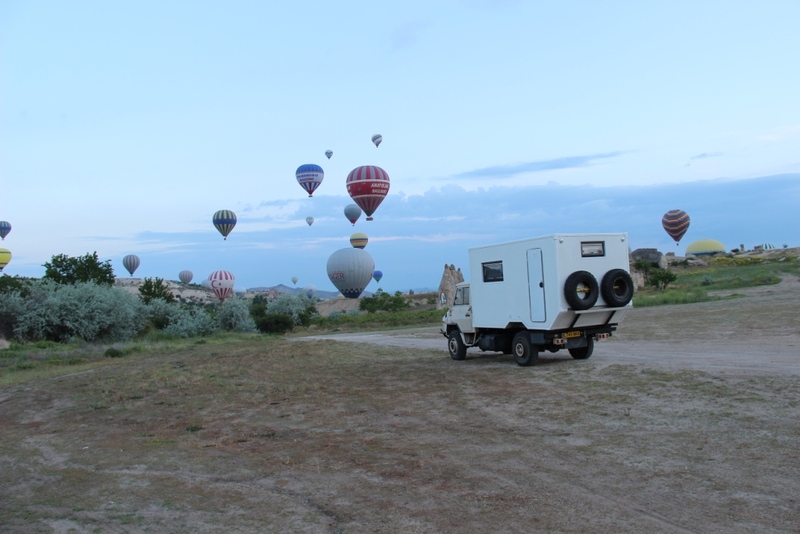 Trucks containing support crews and would be balloonists were rushing around our campsite – which had been so tranquil the evening before. By the time we made it out of the truck many of the balloons were already in flight, and yet more were going up every minute from launch sites all around our little camping spot. 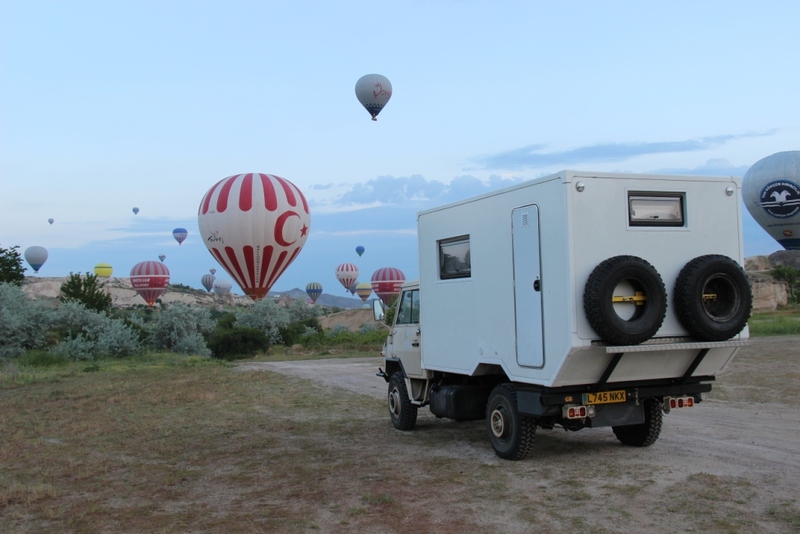 It was a stroke of luck that they hadn’t needed to launch from the particular field where we had set up camp. Each morning about 100 balloons polka dot the skies with colour, it’s an amazing spectacle, all the more dramatic seen through half-asleep eyes that are learning about it for the first time. We stayed up and enjoyed a breakfast with the early morning light, and just as we were doing so another expedition truck, considerably larger than ours, wobbled into sight over the horizon (Ivor, take no notice, size isn’t everything). Its occupants were a French couple that we had met the previous day and their truck an ex Paris-Dakar competitor – they too had been camping out in the valleys, and were awoken to a surprise. It’s always nice to meet other folk up the same things, if only to assure us that we might not be completely foolish. After giving Ivor the tidy up he had needed ever since leaving Toulouse in such a hurry, we went for a little drive around the area, as much to have a play with the 4×4 as anything. We went back to town, and unloaded the bikes for their first outing of the trip. The ride was hardly epic in distance, but the trails flowed smoothly along the valley edges, giving us a taste of some of the finest single track out there. Upon our return, Ivor had another little surprise for us – another small patch of oil on the tarmac, a seal on the transfer box – which provides drive to the front wheels was starting to weep. The old adage that time heals all does not, unfortunately, apply to leaking transfer box seals – in fact quite the inverse. They need parts to be shipped from America, and some rather expensive oil. However, with the aid of the internet and a helpful Turkish speaking restaurant owner the parts were found and a hotel en route was booked for them to be sent to. By now it was getting late, so we decided to camp up in the same spot – reasoning that if the baloonists hadn’t needed the site to launch from that morning, then surely they wouldn’t the next day either. What idiots. It takes quite some time between the first loud knock on our door for our sleeping limbs to work well enough to climb out of our bed and open the door. Long enough for the knocking to turn into Turkish shouting it turns out. You will have guess by now what had happened. The guys who had arrived at 5am to set up the balloon were actually very polite and reasonable once we were up and about. 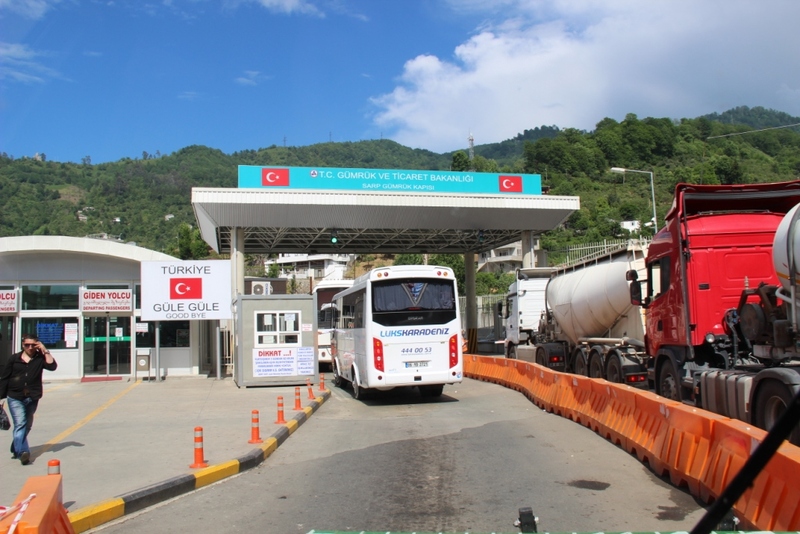 We got out of their way and decided to make the most of this early start by hitting the road north towards our rendez-vous with the parts shipment in the town of Trabzon. Having covered plenty of miles in a relatively uneventful day we set up camp nice and early. Kim spotted a disused quarry that would make the perfect rest spot. No-one was going to be getting a hot air balloon launched from there. Follow it, ignoring common sense, as closely as you can. Our route for the day, we were soon to discover, would be a true highlight of the trip so far. 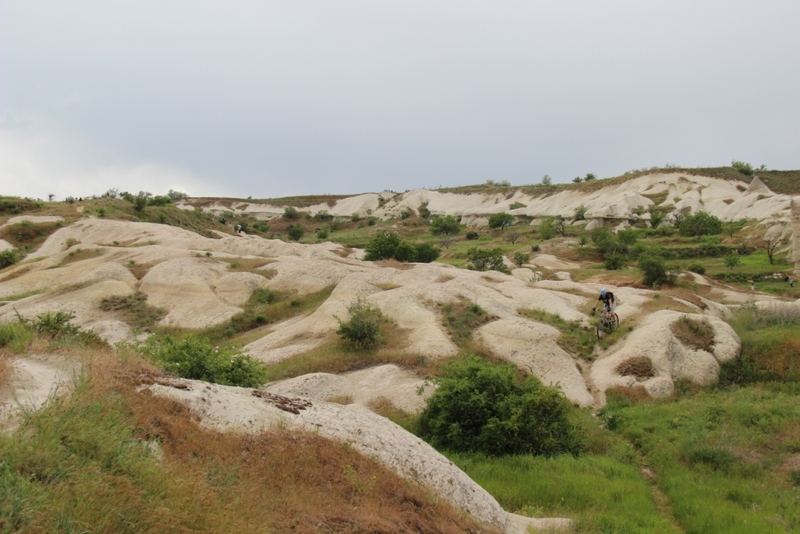 It was just a couple of hundred km to Trabzon, but across some quite considerable mountains. The route would take us through isolated villages, through passes over 2000m high, beside snow fields, and along narrow dirt tracks next to tremendous shear drops. Some of the locals made a mockery of our offroading prowess by performing the same feat in every day road vehicles, sometimes with passengers on the roof – but they were generally very happy to see these tourists so out of place – and rarely did we cross paths without exchanging a friendly wave. We arrived in Trabzon early enough, but had been exhausted by the day’s excitement – we had just enough energy left to sample some local cuisine before settling down for a well earned rest. Using the hotel internet, we were quick to discover that we had been insanely ambitious hoping that the parts would arrive by now. We decided to head to Batumi in Georgia straight away – where we could apply for our Azerbaijan visas – which would also take a few days. That way when the package did show up we could just come back and grab it. Using Google translate in ‘real-time’ (as businessy people like to say), we arranged with the hotel staff that we would call, say our names then followed by the word “Packet”. They could then reply “Yes” or “No”. What a brilliant plan, what could possibly go wrong?! Hey Kimmy & Vaughan! I’m loving your pictures and stories of your adventures so far. How is the Turkish tea? The hospitality is clearly in abundance. Safe travels you two and keep us updated!